Theres a difference between feeling lonely and being alone. Last night I had no plans. My friends were busy, Stephen was home with his family, I had finished all my editing and as luck would have it the power was out and we had no wifi or television. Perfect. I ran myself a bath to keep my mind focused on something else. I focused on the running water hitting the base of the tub, its sound changing as the water levels rose. I lit a candle in the corner of the room, its fragrance entering my nostrils and engulfing my body. 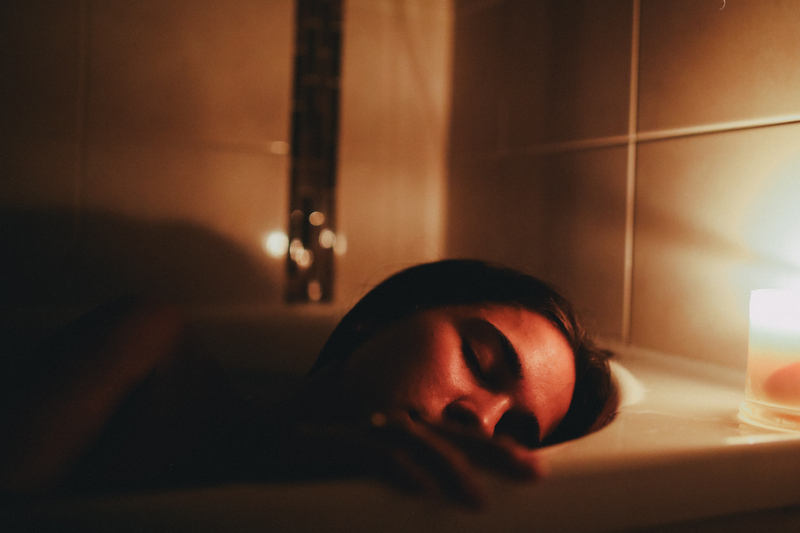 I stepped into the warm bath and my feet tingled at the heat but they slowly adjusted as I lay myself into the curves of the tub, my hair floating atop the water. The distractions ran out quickly though and I awoke from my thoughts to a bare and empty room. I was alone in this bath, completely alone. I feared I would not enjoy the choice I had made to lie here within the water. I feared I was leaving my vulnerability exposed to the loneliness I was sure would arrive. But it never did. The loneliness never came. For I was alone and not lonely and it took me a whole bath to notice the difference. I think we so often feel like we need x, y and z to be complete. It may be a lovers kiss, or a friends embrace. It might be a new episode of your favourite TV show, or a Coldplay album on repeat. I think we search long and hard to find things to fill our lives with to ensure we never have to be alone. And I think that's because many of us don't know how to deal with being alone. We reason with ourselves that being alone equates to loneliness and therefore we don't let ourselves ever go near it. We surround ourselves with distractions, constantly fuelling our minds so we never have to feel this feeling. But that's the thing isn't it. Loneliness is just a feeling, not a state of being. If there's anything I've learnt in the past year, it is we have the power to control our feelings. We have the choice whether or not we want to feel happy, or sad, or angry or even lonely. It's true we sometimes can't control our emotions, that our bodies have adapted to certain events and situations to react instinctively to feeling a certain way without a distinctive choice being made, but if that's a feeling we don't like I believe we're allowed to use our willpower to change it. I've felt lonely before. I've felt excruciatingly lonely before. I've been in the middle of a crowded room or in the midst of a warm hug with Stephen or laughing with friends and have felt so lonely I wanted to curl up into a ball. But I believe we have the power to move forward and change the way we feel, to embrace the good in our lives and see past our feelings of loneliness and look towards everything else that surrounds us (other than isolation). It could be friends, family, studies, nature, or just the bath you're sitting in. I feel there is merit in being alone and yet not feeling lonely, to be content with just being in ones own company, or in fact being content with whomever's company you're a part of. Fighting loneliness is hard, but I truly believe it can be done. How do you fight loneliness?? p.s. I'm waiting for the world to scream out April Fools! and tell me it's still March. The fact it is already the fourth month of the year has to be some kind of joke...right? Being comfortable with being alone is such an important skill, because you're right. We can control our own emotions. We have complete control over ourselves. But to master that, we need to be alone with our thoughts. Sometimes other people make us feel more lonely than being alone. Wow, those three shots are absolutely incredible. I'm not sure which one I like even slightly more than the others. This post definitely resonates with me. It seems that a lot of people don't understand the concept of being alone and being okay with that. First of all I wanna point out how beautiful the photographs you took to illustrate this post are ! Loneliness and being alone really are two seperate things. The proof is that you can feel very lonely when surrounded by the wrong people sometimes. Despite being an extrovert I adore being on my own, especially in the early morning or late night, then I can really do my own thing, read for hours with a good cuppa or anything that pleases me at the moment, it's the nicest thing ! Loneliness is a feeling, you're right, a feeling I know that we all feel in our lives if not more than once for sure. ahhh, yes. so on point. your writing is just so soulful and it speaks with such a depth. Really great post Samantha. I think a lot of people don't know the difference between loneliness and being alone. I'm alone most of the time and I actually feel content 99% of the time when alone. However, when other people are around I feel much more lonely because it's a reminder that most people have someone to spend their time with and can leave at any time to go back to their significant other and I have no one to go home to. But for now, I'm just going to continue enjoying being alone, content and free to do whatever I like whenever I like. Desperately needed to read this today. I feel loneliness more than I can say and so sometimes I do fear being alone. This is so beautifully written and well said. Thank you for capturing words that I never would be able to.